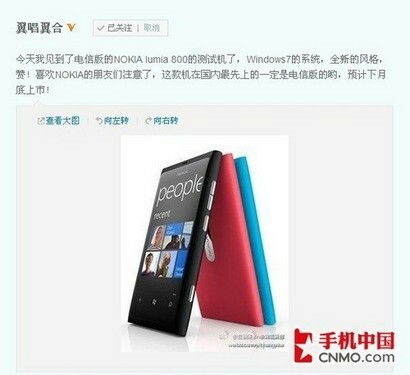 The Nokia lineup will arrive in China on March 28th, but the Nokia Lumia 800C (CDMA version of Lumia 800) has already been set at a lower price by China Telecom. Specifically, the price on the Lumia 800C has been cut down from 4,899 yuan ($774, €593) to 3,899 yuan ($616, €472). That price cut is about $150 less and €100 less respectively, which is a noteworthy drop. China Telecom will also increase subsidies once available and therefore lower monthly prices to as low as 19 yuan ($3, €2.30). No information is available on the duration of the device prices or monthly prices. Take advantage, as soon as possible, while they are still active either way. Keep in mind that China has also been one of the best markets for Nokia devices. With Nokia looking to replace Symbian with their Windows Phone lineup in China, China Telecom may just be cutting prices to facilitate Nokia in their Symbian-Windows Phone transition. Also, with the competitive edge Nokia has already displayed, this price cut may also be in response to HTC’s Triumph release which will prequel the arrival of the Nokia lineup.